INDIANAPOLIS (CNS) — When Shawn Gillen reflected on her participation in the inaugural Indiana March for Life, she had only one regret. Gillen was one of approximately 500 participants in the first Indiana March for Life in Indianapolis Jan. 22 — the day when, 45 years ago, the Roe v. Wade and Doe v. Bolton decisions by the U.S. Supreme Court legalized abortion across the country. The event was the culmination of efforts by the Archdiocese of Indianapolis, the Diocese of Lafayette and Right to Life of Indianapolis. Their goal was to support and raise awareness of the pro-life cause, and to promote pro-life action and legislation at the state level. And what better place to accomplish such a goal than to march up Capitol Avenue in Indianapolis and hold a rally outside the Indiana Statehouse, where the state’s General Assembly is currently in session. After the rally, Sandy Burton of Bread of Life Ministries Church in Avon looked up at the Statehouse’s towering limestone facade. Her description captured the crowd that processed to the Statehouse from St. John the Evangelist Church in Indianapolis after a pre-march Mass. Banners, balloons, signs and chanting voices all proclaimed the sanctity of life in the downtown Indianapolis procession. Trying to tame a yellow “Life” balloon blowing in the gusty wind, 10-year-old Eli Elmore said he thought it was important to march “because babies don’t have the choice if they live or die. They have their entire lives ahead of them, and that shouldn’t be ruined.” Eli is a member of Southside Christian Homeschool Academy in Indianapolis. Another youth participating in the march had a special reason to promote the pro-life cause. 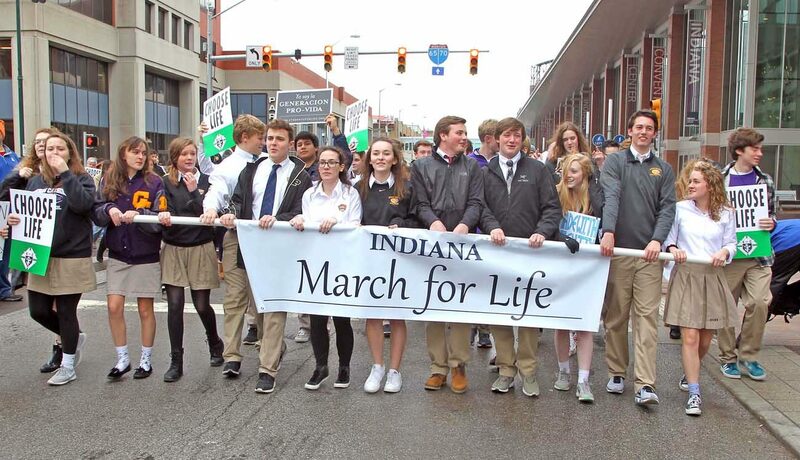 Young adults also were well-represented in the march, including members of the pro-life club at DePauw University in Greencastle. Drew Cobb, a freshman, proudly waved a flag bearing the school’s name as he marched. There were plenty of little testaments-to-life being pushed in strollers along the way to the Statehouse. “I can’t think of a better witness to life than to bring my children,” said Aurora Verkamp as two little faces peered out from a double-stroller. “Going to Washington (for the national March for Life) is just not practical given my current situation,” she said with a grin toward her toddlers. While the only toddlers in his life are now his grandchildren, that didn’t stop long-time pro-life advocate Steve Martin from taking part in the march. “When I heard (a) high school youth group chanting as they walked, I was in tears,” said the member of St. Monica Parish in Indianapolis. “It is such a powerful thing to hear high school kids pick up this issue and be as excited as they obviously were. After the march and rally, many participants ventured inside the Statehouse to witness a rose ceremony. There, 45 people each held a sign representing one of the years in which lives were lost to abortion since it was legalized in 1973. On each sign was the number of children aborted in that year. The combined total was more than 60 million. The Indiana March for Life event ended later in the evening, when about 150 people participated in a youth and young adult rally and Holy Hour at St. John the Evangelist Church. Abby Johnson served as the keynote speaker during this vigil for life; she shared a message similar to one she gave at the earlier rose ceremony. The former Planned Parenthood director turned-pro-life-advocate told the young people how she regretted taking so long — eight years — to leave a job where she assisted in the abortions of children. Silent prayer and the exposition of the Blessed Sacrament followed in the darkened church before the soaring, heartfelt singing of “Holy God, We Praise Thy Name” closed the rally — and the day of witness for life. From the opening Mass to the end of the evening youth and young adult event, the entire day was a success in the eyes of Susan Hoefer, coordinator of natural family planning for the Lafayette Diocese, who helped organize the inaugural Indiana March for Life. “I am filled with joy about what I’ve witnessed today … everyone coming together to proclaim that all human life has inherent dignity and worth, given to us from God Almighty,” she said. Hoefer is a reporter at The Criterion, newspaper of the Archdiocese of Indianapolis. Assistant editor John Shaughnessy contributed to this story.